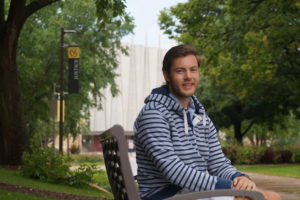 Zach’s favorite part of the Gustavus community is the sense of connection. The Gustavus community is fortunate to have well-rounded students who live up to the five pillars of the college: excellence, community, justice, service, and faith. Junior Zachary “Zach” Diedrich adheres to all these values, as he is an accurate representation of the pure goodness that Gustavus has to offer. “Zach Diedrich approaches every situation with the perfect amount of charisma and thoughtfulness. He is passionate about every single thing he does, which is an incredible gift to have,” Junior Joy Dunna said. Zach is from Bloomington, Minnesota, and is currently a vocal music education major. Although he started out as a math and economics major, he soon realized that he was not interested in it, and did not see himself doing that for the rest of his life. Once he arrived at college, he began taking private voice lessons, history courses, and theory training which made him a better singer in general. He was able to apply this vital knowledge in the various musical orgs that he is apart of. “What I love most about Zach is, he’s passionate and a wonderful individual. He knows how to put a smile on my face when I’m having a bad day. He always seems to put more than 100% into everything he does and I adore that about him. The most defining part about him is he radiates positivity,” Junior Ana Chavez said. Ever since his first year, he has been a member of the Gustavus Choir. He began singing in choral groups during his sophomore year of high school, and immediately fell in love with it, and it also boosted his self-confidence. He is also in G-Sharp Acapella where he learned to sing a different genre of music with a small group of guys who get along well together. “We sing a lot of dad-rock, pop, and a sometimes we sing a classical piece…it’s a big difference compared to regular choir where we just sing a lot of secular music, so it’s cool to be able to sing both types,” Diedrich says. Because of the wonderful experience in choir, it also prompted him to change his major. Another one of Zach’s notable commitments is being a CF (Collegiate Fellow). This will be his second year, and he is currently in Sohre. Being a CF has been fulfilling for him to meet new people, and to become friends with those whom he probably would not have interacted with otherwise. As a CF in Co-Ed last year, many of his residents were involved in sports, and because he had never really been a part of that, it was interesting to have opportunity to know them on a deeper level. He appreciates having daily interactions with his residents, and wants to be that positive, happy source of support they can go to whenever they are having a rough day. “I think the most defining part about Zach is the way he carries himself; he’s a positive light to those around him and reminds people to love themselves. Zach is great because he is always willing to listen and encourage those around him to be their best self,” Junior Taylor Kmiech states. Zach, a member of the Gustavus Choir, has been involved in musical groups since his sophomore year of high school. Zach’s favorite part about being a CF is the strong sense of community. That is why he chose to attend Gustavus because no matter where he goes, he is able to recognize a friendly familiar face. As most people who first come to college, Zach was concerned about making friends and fitting in, but soon realized through social gatherings like Christmas in Christ Chapel, that he truly belonged here and felt welcome among so many talented, kind-hearted Gusties. “I really feel I have developed relationships with people over the last two years, and found my place here…no matter where I walk on campus, I see at least one person I know and have a connection with, so there’s always someone to say hi to. In terms of this future after Gustavus, Zach’s ultimate goal is to become a high school choir director. Being involved in theatre, choir, show choir, and band throughout high school really defined Zach’s identity on a deeper level. Many students’ interests lie in music, so he wants to be the teacher that helps them foster that excitement, especially as it is a part of every person’s life whether they realize it or not. Even though students do not have to study on music on a professional level, Zach firmly believes that it will remain a lifelong aspect of who they are. He absolutely loved being in show choir in high school, so he is eager to give students the opportunity to thrive in that environment too. “My advisor, Dr. Dean and I have talked about doing an independent study in show choir, because he used to be show choir director, so hopefully that will be something I will be able to do,” Zach says. Part of his goal is to help start show choir programs in high schools that do not have them throughout Minnesota. Zach is a highly motivated and accomplished individual who has made a beautiful impact on the Gustavus community. He is the essence of Gustie who “shines” in the most humble, gracious manner, and has become loved by so many who he has deeply touched. Congratulations Zach, what an honor to be presented by your fellow Gusties…We are again very proud to be your grandparents. See you in October for your 21st Birthday celebration.